There is currently much activity in the reception area of Orwetoweni with ten houses already with walls, ten others with the walls almost finished, and one house being roofed. 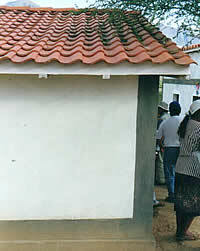 There are two places where the adobes (sun-baked clay bricks) are being produced and enormous clay deposits available within this housing project of the Clay House Project/SODI. There are already 170,000 adobes made, sufficient for 75 houses! It is the most impressive adobe factory I have seen in my life, said Kurt Rhyner, together with a pilgrimage of people moving adobes from one place to another. There is a price for each activity and the beneficiaries have to either pay for the adobes or make them. This is purely a popular activity, with the poorest people as the micro-entrepreneurs, fabricating adobes and selling them. In the second week of October, investigators from Guatemala, Ecuador, Nicaragua and Switzerland met in Nicaragua to establish an action program which will include students from three Latin American Universities. They will interview experienced masons, document their results in outside plastering and submit the recipes to laboratory testing, in a first step. By march 2003 we can expect the first results.